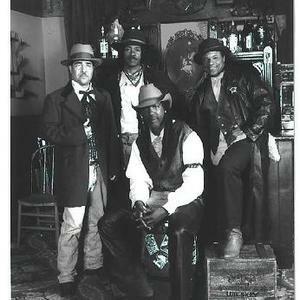 The Reggae Cowboys' name came from Stone's fascination with the role of African-Americans in settling the West in the 1800's. "One in seven cowboys were Afro-American. Nat Love was a rodeo champion and Alberta's John Ware was one of the best-known ranchers in Canada. Bill Pickett actually invented the sport of bull-dogging" says Stone. Reggae Cowboys pay tribute to the black cowboys of the past century and the contribution they made to cowboy culture. Take a look at the pictures to learn a little more about the black cowboys who are honored in the song "Tell the Truth"
The West Indies meets the Wild West! Country influences are widely pumped through the radio stations and films in the Caribbean islands, so a lot of West Indians grew up listening to country music. Stone grew up watching Westerns starring Clint Eastwood, Gary Cooper, Gabby Hayes, Audie Murphy and Fernando Sancho. In the early 1900's, Stahhl competed in an Oregon rodeo and made an extraordinary ride. However, the judges awarded him second place for a ride that deserved a first place finish. It was clear that skin colour had been factored into the final tally. To protest the judges' decision, Jesse rode his next bronc facing backwards with a suitcase in his hand.